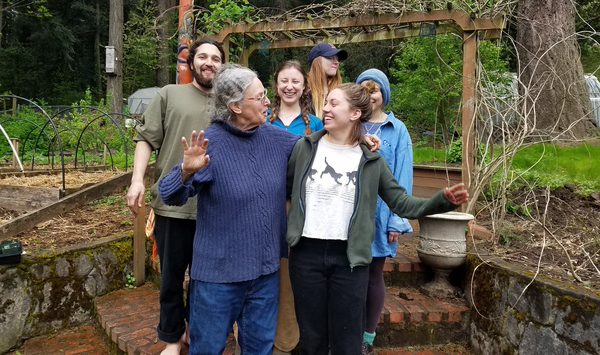 WISDOM HONORED WITH “OUTSTANDING COMMUNITY PARTNER SERVICE AWARD” | Wisdom of the Elders, Inc.
Lewis and Clark College has hosted a group of students who have joined us monthly at Wisdom Gardens this past year. Last month, we were honored to receive the Outstanding Community Partner Service Award for “our exemplary dedication to serving the community.” Many thanks to Harold McNaron, Director of Student Leadership and Service at Lewis and Clark. Very special thanks to student leader Ajna Weaver who has coordinated student trips to Wisdom for the past year. She graduates this month from Lewis and Clark College and we wish her the very best in her future career. The student group from Lewis and Clark College helped Wisdom prepare their heirloom vegetable starts for the upcoming Vegetable Start Plant Start. Join us Saturday at 3203 SE 109th Avenue from 10 am to 3 pm.